horzepa: 12-Band World Radio - $50 Value, Yours Free! I get lots of e-mail trying to sell me lots of stuff, which I usually ignore, but yesterday, the subject of one e-mail caught my eye. It read "12-Band World Radio - $50 Value, Yours Free!" 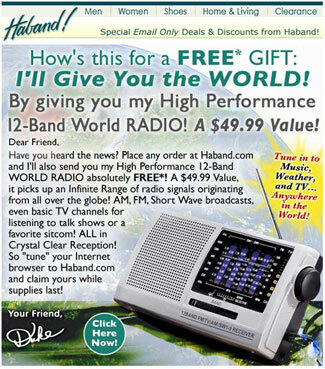 The e-mail was from Haband and in order to get the free radio, all I had to do was buy something from them online. I figured that there must be something I needed. One thing led to another (as it often does on the Internet) and I came across a pair of women's boots on sale for $19.99; a pair just like the ones my wife had been looking for. I showed my wife the boots and she agreed, so I ordered a pair and wait for the radio. I don't expect much, but the price was right and you ever know, I might be surprised. You can expect a full report here after the radio arrives.